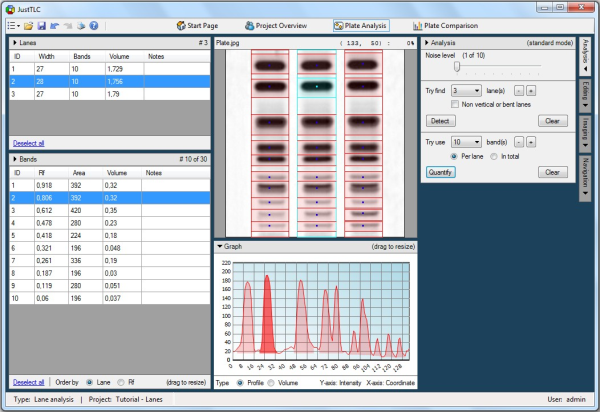 Plate analysis is done in the Plate Analysis ( ) control view. By double clicking on the plate "Plate.jpg" you will be redirect to the view, which is shown below. In the upper right part you will find the Analysis button. 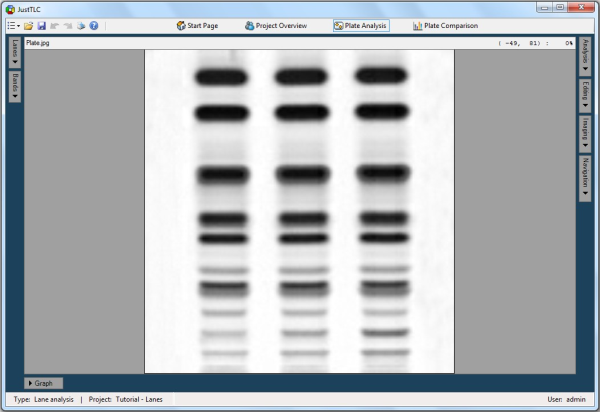 Click it and the Analysis panel is shown. Here, you find controls that are used when automatically analyzing your plates. Use the Noise level track bar and set the value to 1 of 10. This tells the detection and quantification algorithms how much to smooth the image. Continue and change the number of lanes to try to locate from 10 to 3. Click the Detect button and the lanes will be detected in the image. Detected lanes are marked as red polygons in the image. Expand the lanes table by clicking on the Lanes button in the upper left part of the window. In the table the number of detected lanes is shown in the header and the lanes properties such as ID, width and volume are shown in the table. Select lane two by clicking on the row in the table and note how it is highlighted in the image. By clicking on the Graph button, located at the bottom of the screen, the profile of the lane will be displayed. Finally, set the number of bands to try to locate to 10 and click on the Quantify button located in the Analysis panel. Now, the lanes are quantified by detecting present bands and they are marked as rectangles in each lane. The profile graph is instantly updated and peaks are filled according to the quantification result. Highlight the second band from the top in lane 2 by clicking on it in the image and expand the bands table by clicking on the Bands button in the upper left part of the window. Details about each band in the lane is displayed and highlighted. You have now analyzed your first TLC plate in the project.